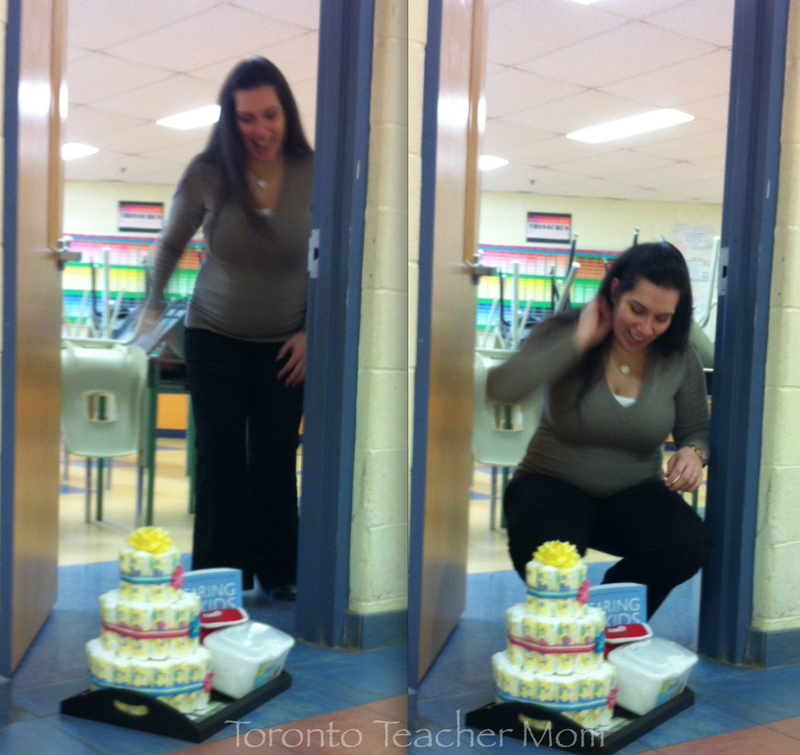 When I was pregnant with my first child, I secretly wanted to feel spoiled and was hoping to have a fun little party with my family and friends. I felt like it was finally my turn to wear the silly hat made of bows and laugh as guests took part in equally silly games. Alas, I wasn't so lucky to have a baby shower or to get to sign up for a baby registry but was utterly delighted when my co-workers surprised me with a very thoughtful party one day after work. There's something about being pregnant and getting showered with attention and some baby gifts that makes the whole experience all the more special. 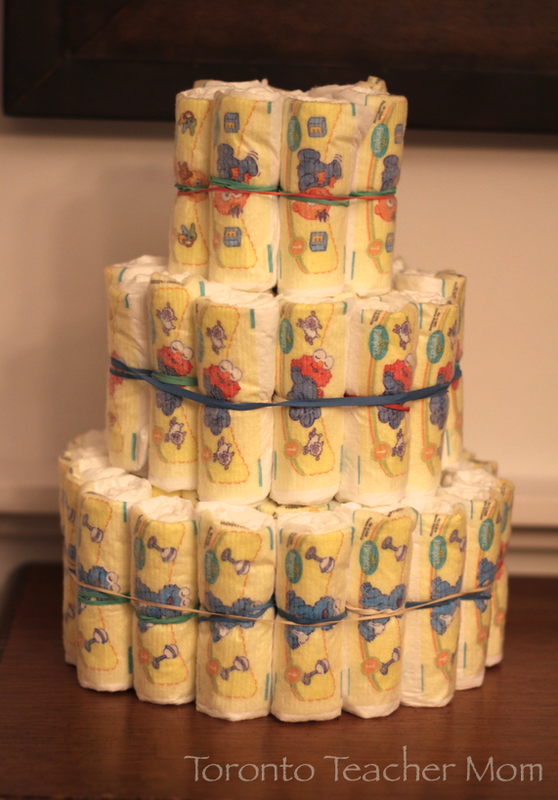 So when I was offered a chance to surprise an expectant mom with some P&G products as part of the Ding Dong Diaper Ditch movement, how could I resist? To fancy it up, I decided to make one of my diaper cakes that I enjoy making so much. My kids even helped to roll up the individual diapers and secure them with a rubber band. Then we layered them around a paper towel roll and secured with larger rubber bands which were later hidden behind some ribbon. 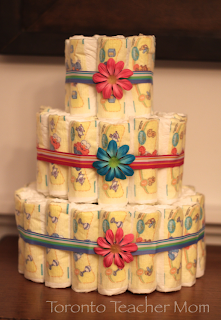 (For step-by-step instructions, check out my diaper cake tutorial as featured on Practical Mum.) Then I arranged them on an easy-to-carry wooden photo tray that she can later use to display photos of the baby. 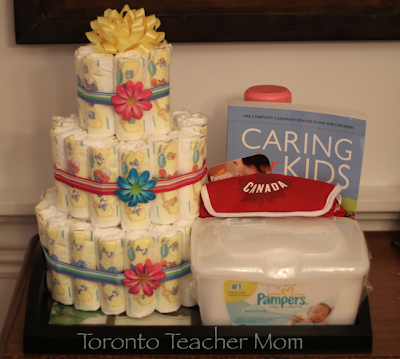 I also threw in the Pampers coupon and the Gifts to Grow points sticker from the package of diapers. 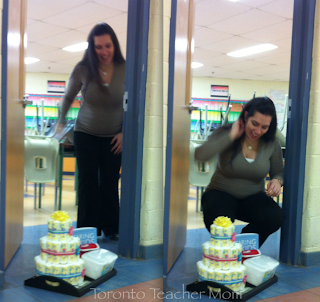 Shortly after I knocked on her classroom door, she was surprised to find her first ever baby gift. The look on her face clearly showed how overjoyed she felt. Mission accomplished! Check this out! Well.ca wants to help new parents, too. 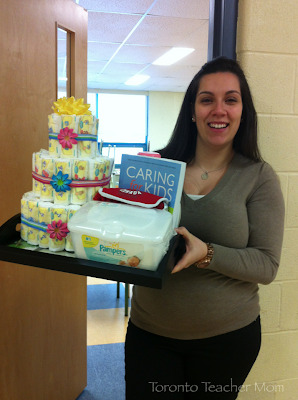 Subscribe to Pampers on well.ca before April 15 and get a 15 per cent discount and up to 500 Gifts to Grow points on select Pampers purchases! Plus, get 50 bonus Welcome points when you sign up. Please note: By entering this contest, you are accepting that, if you win, your contact information will be shared with a P&G PR agency for the purpose of mailing your prize. Also, this giveaway may appear on other blogs as part of the #PGmom program. However, to be fair, you can only win once per giveaway. If your name is chosen more than once, another winner will be selected. Me! Baby #2 is due in June! I would give this to my sister in law because she is pregnant with her first child and could use this. A good friend who is having her first! One of my dayhome clients is expecting a baby any day now, I would give it to her. My neighbor is expecting her first in April so this would be a first welcome home from the hospital gift for her! my sister, she's giving birth in 2 months! Would love to give it to my friend, she is a new mom. This would be for my daughter if I won. She just had a baby and is coming home to visit for a month. I can hardly wait to see my new granddaughter and the rest of the family! My niece is having a baby girl in april.so this would be a nice gift for her. What great news! My friend just received the same news only she's facing complications and sever pain due to fibroid tumours. I'm hoping all that patience and effort has finally paid off. I would give this to my friend, she is having her first baby in May! I would donate this to The Single Parent Center because I know there is a woman and baby out there that could really use this! What a great idea, Anne! I would give this to a friend at work who is expecting her first baby in June because she can use all the help she can get. Life is hard for new moms. My ex GF who is expecting in a month! Shes caring and extremely scared, this would brighten her day. My BFF who just had a baby! i would love to give it to a friend in need.. she's got 3 babies and one more on the way!! would be a great surprise!~! I would keep this one for myself because I'm expecting baby number 2 in July! Cheryl, I had no idea! Congratulations! My niece! she is due any day now. I'd give it to my good friend, who just had a little girl. I would give this to myself! What a great idea, Lisa! I would keep it for myself as I just found out I'm pregnant! I would give this to my friend for her baby shower. Aw, how wonderful would that be! Wow! She wastes no time. Congrats to your sister! I would give this to my young niece who could really use the help! I would give this to my cousin who is expecting at the end of this month. I'd love to surprise her. My best friend who is due in 3 weeks! I have a daughter who has a 1 month old baby boy. She could use it. Also expecting for August is my son and his wife in August. Lots of places to go to.